Mixed lot of 20 High Quality mixed, mostly High Speed Steel Threaded Drill Bits (1/4"-28 thread). They are of various diameter sizes, (all smaller than 3/8") and lengths. Uncle Sam surplus. They are mixed, #30 and #40 bits PLUS other sizes, New and Professionally Resharpened and maybe one or two used sharp ones. 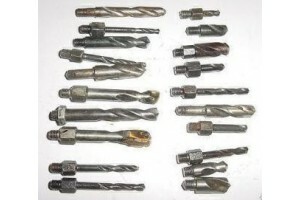 High speed steel bits retail for about $5 each. Get them here for under $1 each. Actual bits shipped may differ some from ones shown on photo, file photo. Sold as is, no returns.